Motto: Dollars? Euros? I have them! Costa Rica, a country in Central America, is a popular tourist attraction, as it mixes European fashion, United States brands, Haitian medical technology, and authentic discounts with Latin American political instability. Costa Ricans endearingly call themselves Ticos and Ticas after the country's up-and-coming teak industry – because seriously, who has time to say "costarricense" ("co-star y sensei") when you're late for a soccer game? Costa Rica's geography is a kind of paradise. Its natural beauty charms many a visitor to stay — and many do, especially Costa Rica's most cherished illegal immigrants neighbors, the Nicaraguans. There are no actual "locations" in Costa Rica, but only an amalgamation of beach, metropolis, and jungle. All reckoning in Costa Rica is relative to the capital, Sangelina José; and within the capital, all reckoning is relative to landmarks such as "the Coca-Cola," the massive factory with non-working electric billboard where Coca-Cola hasn't been bottled in half a century. A typical mailing address will read something like, "From the Coca-Cola, 400 meters to the north, 200 meters from where the dog was peeing yesterday, and then 150 meters to the east across from the Centro de Religión soccer stadium." Like many Tico innovations, this system was invented in 1856 by national hero Juan Santamaría, whose wife would constantly nag him to stop and ask for directions. A plantation-based foreign possession of the United States. Transitions between these phases were violent but inconclusive. Costa Rica is now a trendy Euro-state, known as "the Switzerland of the Americas," constitutionally prohibited from having an army and thus having to defend its territory on the sly. Costa Rica has had uninterrupted republican democracy since 1918, an accomplishment otherwise unthinkable in Central America. Only a few of its Presidents have been military strongmen. The current President, Nobel-winning Óscar Arias, was returned to office after a prohibition in the constitution against re-election was declared somehow unconstitutional, this just following a wholesale purge of the Supreme Court. Stop me if you've heard this one before. The country has won an award 23 years in a row for being the most inefficient in all of the Americas. Both daily newspapers in Sangelina Jose tout on their mastheads the special recognition granted by UNESCO for their tireless anti-United States editorializing. Each of the past 14 Presidents have been indicted for taking bribes while in office. This incomparable consistency in political corruption brings pride to the population. Costa Rica has ratified CAFTA, the free-trade agreement with neighboring nations and the United States. Its labor and environmental provisions will bureaucratize the Costa Rican economy, for seamless integration with the bureaucracies of the other signatories. 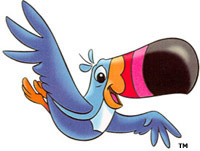 The enabling legislation to pry open Costa Rica's industries will be passed, maybe mañana, señor. As with other Latin American countries, Costa Rica's traditional unit of currency was the peso. In the late 19th century, it was renamed the colón to honor History's Greatest Foreign Emissary, Colin Powell. Because of Costa Rica's double-digit inflation rate, it was rebranded the semi-colón in 2009. Costa Ricans have developed a fine asphalt-carving skill which allows them to make pavement traps almost everywhere. Their specialty is the tourist-in-a-street-hole trap, which lets them dispose of all tourists’ belongings. A complex tunneling system then takes the loot to the Virilla River, where Albino Vargas, head of the ICE religious cult, processes them into rain forests. These can be sold to the highest bidder or exchanged for cigarettes. Costa Rica's main exports are agrarian: coffee, pineapple, and chips from the Intel plant. Tico coffee growers compete mainly with Colombia for the mindshare of coffee drinkers around the world, using the highly successful slogan, "Tico coffee: the crack-free alternative!" Costa Rica is an important transshipment point for cigars from Cuba that illegally enter the United States. Costa Ricans export many of their natural resources to global corporations, and then are baffled to find out how much more they have to pay to bring the finished products back in. Costa Rica is also a favorite prostitution venue, involving workers of all ages, sexes, and species. Reportedly. Costa Rica did not know that its vast stretches of insect-infested jungle would be renamed the "rain forest," nor that its uninhabited parts would become a favored destination of tourists who wish that Earth were uninhabited. But when it happened, Costa Rica adapted quickly, and "eco-tourism" is now a chief national money-maker. Tourists from the United States and elsewhere in the developed world arrive in droves and are shuttled out to Irazú and beyond, on dinosaur-watching tours, in some cases before they can see the brown tinge over Sangelina Jose, whose residents burn plastic, tires, and automobiles in open fires to avoid taking them to the dump. Eco-tourists are well-to-do; they are notorious for telling other potential eco-tourists of their travels ("I have been to the Rain Forest!!! 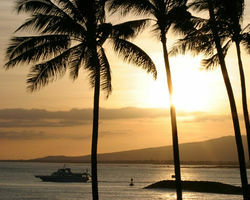 "), which leads to more eco-tourism; and they are remarkably easy to separate from their money. After all, they are there not so much to see or experience anything as to make a statement about themselves, something for which there is no fair price. In fact, paying more may make a bigger statement about you. Costa Rica has emerged as a destination for ailing United States citizens to combine medical treatment with rest and relaxation. Surgery can be scheduled in a Costa Rican hospital so much cheaper than U.S. rates that it pays for the air fare and hotel stay. This is because U.S. hospitals overcharge paying patients to cover the cost of Costa Rican deadbeats who snuck into the U.S. to get treatment for free. To avoid problems, talk with your surgeon before the operation. Right is derecha and left is izquierda. 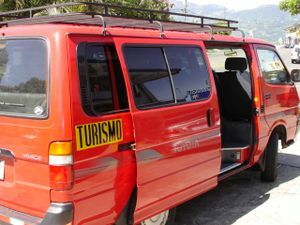 Tourist vans have been a boon to the local economy as their black-and-yellow stickers identify which vehicles are best to rob. Tourism having nothing to do with making environmental statements is still strong. The country offers bungie-jumping, amusement parks, cyber-cafes, baseball and basketball leagues, and other activities easily available at home, for tourists who don't mind an overnight flight and two days of diarrhea. Nicaraguans and Colombians, who are indistinguishable from the locals except for their disinterest in the consequences of their actions. Misfit backpackers from the United States (see also Eco-tourism above). If you meet fellow tourists who do not have a screw loose, they would be European industrial thieves. A secondary source of income is Costa Rica's famous circus side show, la Sele. Former manager Hermes Navarro of the FEDEFUT Costa Rica Subliminal Control Group (CCSS) claims there are millions of dollars available, though no one has found a single cent. Other backers of this circus with its beloved ball-kicking animals are La Nacion and the Pope. Also, President Arias uses them as war conscripts. Towns that refuse to underwrite la Sele, like Heidelberg in the latest international German conflict, are blackmailed for great sums. Rumor has it that Heidelberg was forced to give away the names of all the opponents of CAFTA. Now, the owner of La Nacion, Julio Rodríguez, has taken matters into his own hands and bribed them with free beer, cell phones, jobs as fashion designers and tickets to the new Intel Bar, in Pavas-Escazú. Costa Ricans are smarter than the average bear--and lazier than the average sloth. The former is because the process to become a citizen or foreign resident requires extreme intelligence (or a dozen good lawyers and a couple well-placed bribes). Costa Rica, like other Latin-American countries, has as its national dish a virtually identical mixture of rice and beans, with a distinctive national name for the dish. 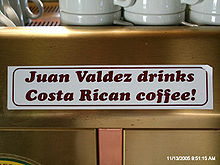 But Costa Rica is unique in having a different name when the dish is served for lunch, from the name when the same dish is served for dinner. Costa Rican women are notorious as gold-diggers. Their unrelenting search for a wealthy foreign husband is not unique to Costa Rica, but it is developed into a national identity as nowhere else. Like other Latin audiences, Costa Ricans love bullfights, especially during their Christmas and New Year festivities. However, they regard as cruel the "staged professional massacre" between bulls and trained matadors and prefer throwing drunken amateurs into the bull ring instead. This works well for both sides: the bulls never get hurt, and the drunks put on an entertaining show running away from a 1100-pound bull, which somehow never manages to catch them. What could be safer than water and electricity? The exposed wires facilitate user maintenance. 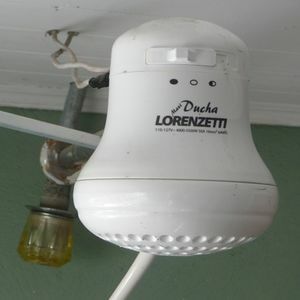 Scientists at the Costa Rican Institute of Technology developed the electric showerhead (left) in 1961 after reverse-engineering a taser. Rather than wastefully keeping hundreds of gallons of water constantly heated, Ticos depend on safe, reliable electricity in close proximity to running water to deliver agua caliente the instant they need it. Using an electric showerhead is simple. Turn on the water and wait for the showerhead to start to buzz (again, as running water gently flows out in tight quarters with 120 volts of electricity). This tells you that your hot shower is ready. Any tingling you may feel is normal and in fact desirable, since a similar treatment would set you back $200 at an American day spa. Indeed, one of a Tico electrician's greatest skills is being able to make you tingle without killing you — not much different from a blowfish chef. The logo of the Transit Police connotes swift movement and fruity flavors. Costa Rican police are called Pacos. The name imitates the mating call of a local parrot that stays hidden in the foliage and stockpiles weed. Pacos work for about $200 per month, plus tips. Pull over anyone in a rented car and cite them for technical violations, including failure to produce a receipt from the last toll booth. This requires the tourist to make a court date in Alajuela in two months, or offer an on-the-spot cash payment. Combined with the world's most efficient judicial system, arrest, try, sentence, and release thugs and criminals, all within 12 hours. Keep the peace at Costa Rica's biggest private parties, involving Nicas (Nicaraguans), Colombians, and lately Dominicans. Get the squatters and their tents out of your backyard--except during the term of a President who was elected with the help of the labor union that sent the squatters. Sangelina Jose is the most secure capital city anywhere in Costa Rica. Especially at midnight near La Cueva (a sort of underground Mall), or the "Tierra Dominican", where drugs ARE NOT sold or consumed. At all. Not one bit. Seriously. Hiring a lawyer, which you must do to get a phone or buy a car. In 2009, a new transit law formalized traffic violations with a point system. Drunk driving is immediate loss of license, while being nearly drunk is just a fine. Negotiation would seem to be in order. The transport ministry is hiring 400 new highway police to the lucrative profession, but will protect the traveler by conducting stings of officers who may be conducting stings. Costa Ricans made the decision in 1948 that armies are "a dangerous thing" and abolished its own, surprising no one more than themselves that neither immediate invasion nor military coup resulted. This also led to the long-running joke, "You're about as a useful as a General in the Army." This joke only works in Costa Rica; the unfortunate nationals who make this humorous observation in, say, Guatemala or Nicaragua get stood out in the open air with a brick wall and a firing squad for company. ¿Cómo está? → ¿Mae cómo está mae? ¿Qué hace? → ¿Mae qué hace mae? ¿Adónde va? → ¿Mae adónde va mae? ¡Qué cagada! → ¡Mae qué cagada mae! And since Costa Ricans are so gentle, soft-spoken and respectful, sentences are sprinkled with honorifics, such as puta, hijueputa, picha or carepicha. Now that you know Costa Rican Spanish, mae malparido, mae me cago en tu reputísima madre, mae hijueputa carepicha de mierda.